Some features are not available for Mendon yet, please check back as more will be added. Burn permits are required in order to burn in Mendon. Applications must be submitted at least one day prior to requested burn date. Front Porch Forum is a free community-building service in Vermont. Mendon neighborhood’s forum is joined with Killington right now and only open to the people who live in either Mendon or Killington. It’s all about helping neighbors connect. You can learn more and sign up by clicking the image below. Posted April 18, 2019 by Nancy Gondella & filed under Uncategorized. 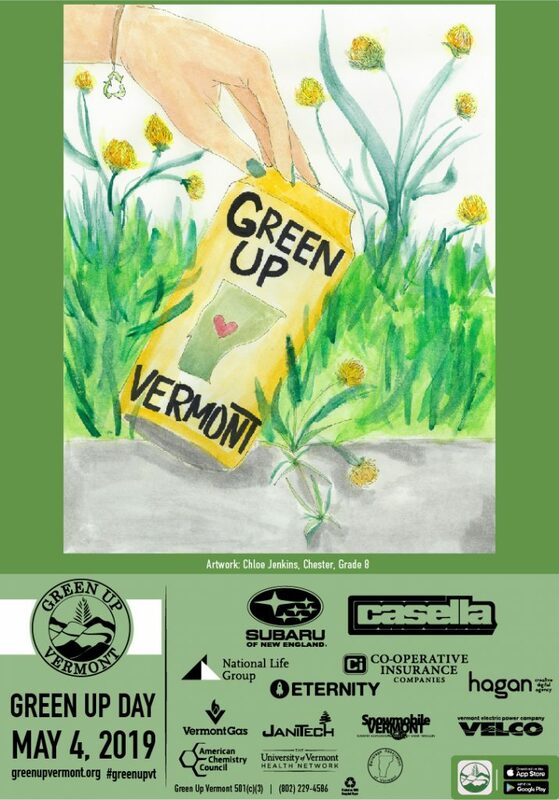 Grab your friends, join your neighbors and get involved in Vermont’s state-wide Green Up Day on May 4th. It’s easy! Pick a road, grab a bag and do your part! Bags for the Town of Mendon are available at the town office. The Town of Mendon (Town) is requesting bids from qualified construction contractors to replace the Culvert 07-06 on Wheelerville Road. The project is located along Wheelerville Road approximately 0.6 miles north of its intersection with Notch Road. Replacement shall incorporate the removal of the existing culvert and replacement with an aluminized CMP (71” x 47”) pipe arch and headwall. Project shall also include site preparation, including removal of loose, woody and deleterious material, removal of culvert, installation of CMP arch pipe, installation of headwall and wingwalls, machine placement and compaction of riprap, stonefill, filter base and other granular material, road subbase and base material, temporary stream diversion, road subbase and road surface course aggregate, traffic control and incidental items. Invitation for bids, Information for Bidders, (RFP) contact is available via Download Electronic Copy: Download Bid Documents as a pdf at https://www.dubois-king.com/projects-bidding-active/ for a non-refundable charge of $50.00. If hard copies are wanted or to submit questions, contact David Conger, Project Manager at 802.728.7225 or at dconger@dubois-king.com. A non-mandatory on-site briefing is scheduled for April 9, 2019 at 10:00 AM at the project site on Wheelerville Road. The Town’s Project Manager will then conduct a site review with interested parties. Bids shall be delivered to the name and address identified in the Information for Bidders no later than April 16, 2019 at 2:00 PM. Proposals submitted later than this date and time will not be opened, and will be rejected. The Mendon Town Office will be closed Thursday April 11, 2019 so the staff can attend the Annual Town Officers Education Conference. Posted March 25, 2019 by Nancy Gondella & filed under News. Over the years, the Vermont State Treasurer’s Office has worked with Town Clerks as a partner in reaching Vermonters with unclaimed property. Unclaimed property could be forgotten bank accounts, uncashed pay checks, unclaimed security deposits, unused gift certificate, etc. It is most often in the form of money, but it can also be stocks, mutual funds, and contents of safe deposit boxes. The property comes from many sources, called holders, such as banks, credit unions, corporations, utilities, insurance agencies, retailers, and governmental agencies throughout the United States. The Vermont State Treasurer’s Office acts as custodian to safeguard the assets until they can be claimed by the rightful owners or heirs. The first link is a list provided by the State of Vermont for Mendon residents. The second link is a copy of the claim form to complete. If you have any questions, please contact the Unclaimed Property Division at (802) 828-2407. You may search for all unclaimed property at www.missingmoney.vermont.gov. * The Selectboard regularly meets on the second and fourth Monday of the month at the Town Office at 5:00 PM. There have been some meetings that have been rescheduled around holidays and other conflicts. Any further changes to the 2019 meeting schedule will be posted on the town website and warned in accordance with the open meeting law. Posted March 11, 2019 by Nancy Gondella & filed under Uncategorized. 2019-Town-Meeting-Minutes are now available for review. Posted by Nancy Gondella & filed under Announcement. If you need assistance making an appointment for the inspection, please contact the Mendon Town Office at 802-775-1662 and the office staff will be happy to help you.